I agree, it will be nice to know what Skarloey's face will be. I would prefer it from the model era myself, rather than from the CGI Animation. I've seen similar things unfortunately, also my local model railway club, which I am a ember of is having (financially anyway) one of its worst years on record. There's a huge train show here in Perth that they used to run every year, but now may only be run once every two years because it doesn't make as much money as it used to. So I may be with Nykrivas, to an extent, in the cynical department. I honestly disagree with both of you on the idea that the hobby of model trains is "dying" when it clearly isn't. If it were, Bachmann and other ranges wouldn't be making anymore models, and there would be a lot less train shows in other areas. It might be weaker in your areas, but from what I'm seeing from shows in my area as well as other train show videos I've seen online, they seem to be still be going on strong. Even my dad went to a train show in Italy this summer and he said it was very packed over there too. I personally think the key difference here could just be a location issue or maybe even a timing issue, but to say that the hobby as a whole is "dying" really is an exaggeration. To anyone who saw Skarloey's prototype earlier this year or has good images of it, is the face CGI or model era? And what of the bodywork too, for that matter? Skarloey will have a CGI face, and the body work is mostly based on CGI too with the rivet patterns matching the real Talyllyn. I agree, Model Railway's are not dying. Last year, I went to the The Warley National Model Railway Exhibition which is a very popular yearly Model Railway Exhibition in Birmingham at The NEC in the UK, and inside you could hardly move with people. Before the doors opened, people where almost standing on each other on massive queues, and it was the same story inside. I am going again to this years which is in about 2 or 3 weeks time! I can't wait! I'm always nervous when I start new threads. Don't be nervous. I was thinking just a few hours that the Disscussion about new Bachmann Thomas & Friends Gauges was causing a bit of a stir, so it should have it's own Disscusssion thread, and is not cluttering up other Discussions that are about other topics and making them look messy and confusing for other Users. Follow up on my last post. I guess I was just being cynical. But at the same time, I've been debating myself whether I should quit my Thomas interest. But it seems that I can't get rid of something that's been cemented in me. Moving on now. I don't know what the big deal is with Skarloey having a CGI face, or being based off his CGI render. His CGI face is hardly different and I think his CGI render is beautifully designed with all those extra details. I don't think I will ever give up my Thomas interest. It does matter, because it is do with the style Skarloey will look like. 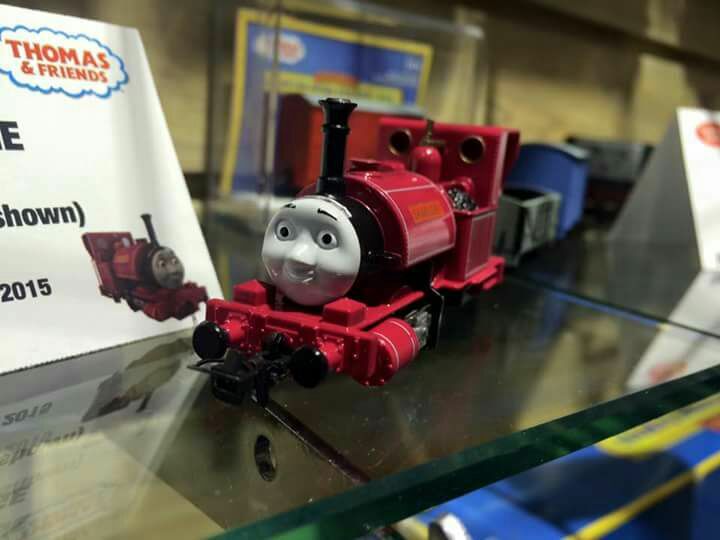 Skarloey looking like the classic model Seroes would be better. Personally I'm happy enough that Bachmann made Skarloey altogether, regardless of design and face choice. I think because of the Bachmann Skarloey's design and how detailed it is, it will not only be popular with Thomas fans but it will especially be popular with OO9 modelers who want to convert Skarloey into a model of Talyllyn. Even some of my friends who don't model in Thomas are buying it for that reason alone. I agree, in fact I even believe Talyllyn was just this year repainted into a new colour scheme (or color scheme, if you prefer), that very closely matches the colour of Skarloey, meaning conversion would also now be easier than ever, and I also very much agree on that point, I'm sure OO9 modelers would be ecstatic to have an easy Talyllyn kitbash. For next year in HO scale, we'll most likely get Paxton or Daisy. I'd welcome either. I would love to get both of these, especially Dasiy; But how do you know that we will most likely get Daisy and / or Paxton released in 2016? I'm only guessing. Those are the most talked about. Paxton has been in the older fans approval for a long time, and he would simply be a repaint of the Diesel tooling. Daisy returned to the show recently in CGI, she would stick to the Gullane era characters (which the HO range has done so far), and she would be a fairly simple tooling to do. I agree, actually. Paxton would be a repainted version of Diesel, 'Arry and Bert with a different face. As for Daisy, I expect that the tooling for her would be in the Bachmann Branch-Line (UK), so I am sure Bachmann Trains (USA) would be able to get their hands on it, to release Dasiy!